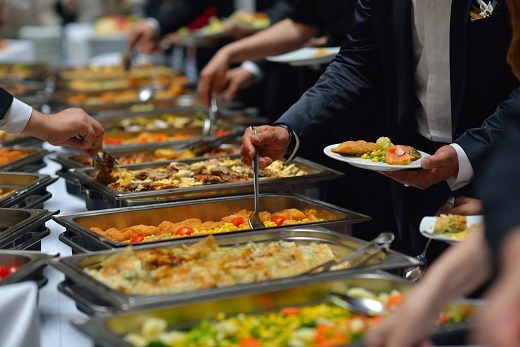 Catering is often one of the most expensive portions of a wedding, typically serving on a per person cost basis. Navigating the ins and outs of catering can often seem like a daunting task and the lengthy contracts that occasionally accompany them can be even worse. To ensure you are getting exactly what you need, here are a few questions to ask your potential wedding caterer. Depending on where your wedding is being held and if you are serving alcohol, specific permits may be required. It is important to know what permits are going to be required for your specific wedding needs and determine if you are responsible for them or if the caterer is. Failing to nail down this crucial detail can be incredibly costly if the contract has been signed and the permits aren’t available. Your potential wedding caterer likely has a lot of experience under their belt, making their recommendation fairly valuable. If you are unsure what to serve at your wedding, the caterer can likely help determine a few different options that will fit well with your target theme. Put their experience to good use if you are at a loss or can’t make a decision. How Is Pricing Broken Down? A detailed pricing list that includes any fees that may be included by your wedding caterer is a great way to ensure you don’t bust your budget. Don’t be afraid to ask for an itemized list of costs and fees that you can easily look over to ensure you are getting everything you need and how you are being charged for it. It is also important to determine whether you have to make a deposit to hold their services and when you final payments are due.